Pattern Notes: CUUUUUUUUUUTE! I did not change a thing. Would I knit it again? I love these! I love the little i-cord ties and I love the little feet and… well, that’s pretty much all there is to them. There’s some garter stitch in there, and there’s some stockinette. Oddly, the garter stitch is knit in the round, which is SO ANNOYING because I don’t like purling with cotton and metal needles. 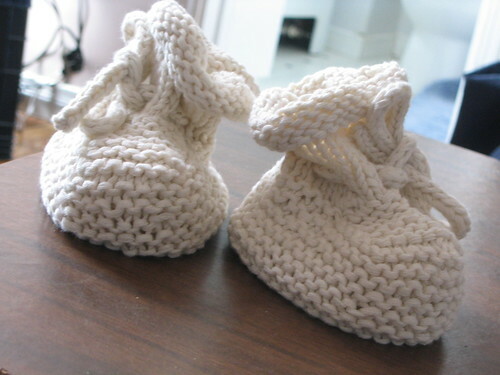 But that’s just me whining; the end result is the most adorable baby booties EVER. I will most certainly knit them again, and maybe even experiment with some seed stitch? I love seed stitch. The next time I knit them, though, I’m going to rewrite the pattern for myself and get rid of all the endless explanations that clog up the pattern. Everything is described in great detail here, which is great if you’re a beginner knitter (definitely the target audience for this book, and something I would have loved if I had started knitting in the future with a bun in the oven) but incredibly distracting if you’ve knitted for any longer than a month. I would definitely recommend this pattern to anyone who wants to knit it, but if you can do without lengthy diatribes about what garter stitch looks like, I suggest scribbling out the pattern in short hand first. You can also use the pattern at Fuzzy Galore; it’s essentially the same, except the “bumper” is garter stitch instead of four rows of knit, four rows of purl, etc and the decreases are k2togs. This is a very common pattern, so I don’t think I’m breaching copyright law by making that observation. Apparently Rocket Bride at Knittin’ Smitten agrees, because she’s published a recipe she learned from the book as well. awwe! I hate when I only want one pattern from a book lol! Those are adorable. I’m working on some baby uggs! I have a really loose gauge, so your mileage will vary. Okay, so I braved the tiny needles. My question to you now is: How long did you make the i-cords? And how do you finish of the ends of the i-cord to look all nice and squared like yours? Mine looks like the tip of a sharpened pencil? Also, is there any trick to weaving in the ends (i-cords or booties)? Thanks in advance for the tips! This entry was posted on May 22nd, 2007 at 4:39 pm and is filed under Baby Clothes, Finished Projects, Garter Stitch. You can follow any responses to this entry through the RSS 2.0 feed. Both comments and pings are currently closed.